VAGO employs around 185 staff who plan and conduct audits, and prepare reports for tabling in Parliament. Our audit staff are professionally qualified and accredited in a broad range of disciplines such as arts, economics, business, law, accounting, public policy, social and natural sciences, and statistics. Our support staff have expertise in IT, human resources, communications, records management and administration. The Executive Leadership Team consists of the Auditor-General, Deputy Auditor-General and Assistant Auditors-General for Financial and Performance Audit. Andrew has over 30 years’ experience in public sector external and internal audit at the federal, state and local government levels. He was the Auditor-General of Queensland from 2011 to 2016. From 2003 to 2011, Andrew held various roles at VAGO, including Assistant Auditor-General, Performance Audit, and Assistant Auditor-General, Financial Audit. Dave was previously Chief Executive Officer of the Alpine Shire Council in North East Victoria, where he led significant reform initiatives underpinned by a strong focus on innovation. He is passionate about delivering better and lower cost outcomes for our clients and the wider Victorian community. 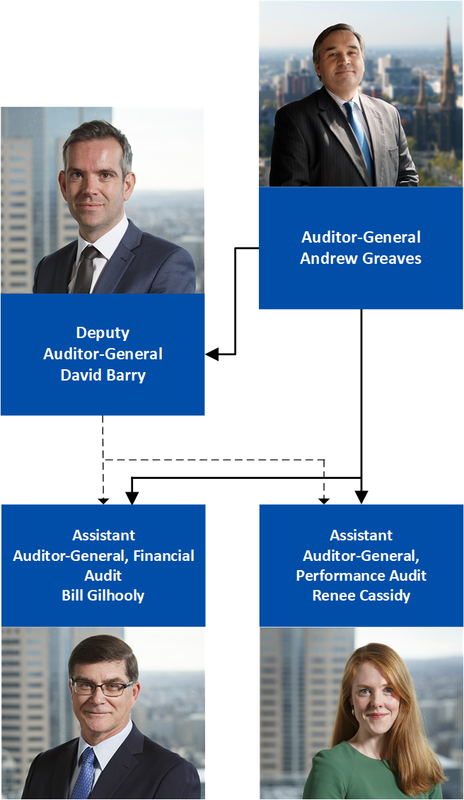 Dave is responsible for the operations of the Victorian Auditor-General’s Office and acts as the Auditor-General in his absence. He oversees the Financial, Performance and Technical Audit business units. Bill was the Assistant Auditor General responsible for leading audits of government financial management and performance at the Office of the Auditor-General for British Columbia until August 2016. For over 10 years he oversaw the office’s largest audit as well as numerous audits of government financial and program performance, and led the office’s IT audit practice. Bill manages a business unit of around 85 employees, and is responsible for VAGO's financial audit activities across a diverse range of portfolios. Renee joined VAGO in 2007 as a performance audit analyst, and has since had manager and director roles. She has a background in health, and has undertaken audit work in a range of public sector areas including human services and justice. Renee has a particular interest in training and development and public sector evaluation. She manages a business unit of around 50 employees, and is responsible for VAGO's performance audit activities across a diverse range of portfolios.